It was my day off and oh, what a happy, sunny day it was! After lazing about at home in the morning, I leisurely strolled over for a long, late lunch at Wide Open Road. They roast their own coffee. This actually wasn't the first time I had had lunch here. 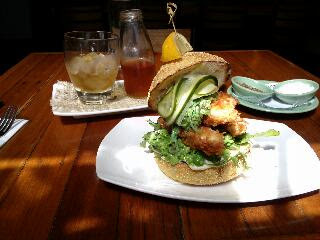 This time it was fish finger sandwich with smashed peas, seaweed tartare and pickled cucumber. It's a huge burger. HUGE. It tasted and looked pretty healthy, which was what I was after. The fresh cucumber crunchiness, soft warm fish fillet, tangy seaweed, soft peas, chewy bread... So delish! Especially the salty/tangy seaweed. This being a rare hot day, the drink of choice was Cascara iced tea. It's brewed coffee cherries, also served with lemon. Lemon wedges were everywhere on my table. It felt like Summer. Love.